Picks and News from @afiskness. It was nice to see the Bulldogs bounce back last Sunday after a very lopsided loss on Friday night to the Gophers. One thing that concerns me is the amount of penalties the Bulldogs continue to take. In the Sunday game the Bulldogs gave the Gophers plenty of special team opportunities to get back into the game, but the Bulldogs were good enough on the penalty kill to get the win. If the strong defense and goal tending remains constant and the Bulldogs can find a little for goal scoring this team will play into late March. There are no NCHC games this week but there are some teams in action. Shillelagh Tournament:Western Michigan vs. Northeastern: I like the Broncos in this first game, the Huskies win/loss record is padded with wins against Huntsville and Holy Cross. As for the second game I will go with a loss to Notre Dame who as the host wins their own tournament. Miami @ Bemidji State: This will be a good test for the Beavers who will be facing a Redhawks team that is as cold as the ice they skate on. This will probably be a couple of grinder games, but I think the Redhawks offense will shine and sweep this series. St. Lawrence @ North Dakota: The Saints travel to Grand Forks with 1 win in their last 4 games meanwhile North Dakota is going through their early season let down having just won 2 games in their last 8 played. The Saints have beat some good teams this year and will likely find one win this weekend. Split. New Hampshire @ Colorado College: The Tigers are not very good and the Wildcats have been all over the board this season. This series looks like it should be s Wildcat sweep, but I think the excuses will be made (elevation, two time zones, body clock, etc.) and the Tigers will get a split. Power play, a long time staple of the Sandelin Bulldogs, is back after going four of seven opportunities in Sunday’s game. The test will be if it keeps up because the game prior was a zero for seven effort. Resiliency continues to be an up with this season’s UMD team. On the road for six straight games and finding a way to come back after Friday losses at UND and UMTC for wins demonstrates the mental toughness of the young team. Penalties! The numbers are staggering after a slight down tick in the minutes, they spiked again all the way up to 19.0 minutes per game and a tie for third nationally for the most. Still on the penalties, another major was logged this weekend when Andy Welinski was shown the gate Sunday for facemasking. In the same vein, Caleb Herbert took three minors Friday and according to Bruce Ciskie, he should have had to pay rent for the space. It just can’t happen if the team is going to reach even near their goals. Split, split, split. The splits get tiring, but at this point, they are good enough. 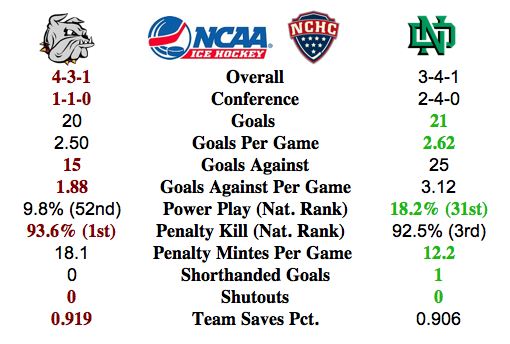 As the season progresses they have to step up to some sweeps to step up in the NCHC. Goaltending at UMD is a “who’s hot” kind of deal. As long as one of them, A Crandall or McNeely, is on, the team can always bounce back. Bold prediction alert, UMD will end up 17-16-1 going into the playoffs. The regular season is just over one-third completed and the Bulldogs have five splits in six series. The remaining series was a Bulldog win and tie against MTU. The opponents so far have been good teams for the most part. In some cases, like this last series, a split is good. But in others, CC and Ohio State, more than a split is expected. But winning some and losing some inexplicably is a symptom of a young team. So is the way they win and lose. The scoring is coming in streaks. Plentiful scoring in one game followed by a drought and not necessarily in that order. It is not a first game/second game of the series thing as UMD has a two game winning streak and a two game losing streak. Up next is another weekend off and time for Thanksgiving. The following weekend brings NCHC league play to Duluth for the first time as Saint Cloud State comes to town December 6 and 7. Renew the rivalry…well at least for the Bulldogs. The Twin Cities campus will stand by Wisconsin and North Dakota as their rivals, but for the Duluth, these are the games the fans really want to win. Take it to Minneapolis and the challenges increase exponentially. So how is UMD going to win at Mariucci? Boil it down to two factors: penalties against and defense. want to give that much advantage to the home team. Additionally the more time UMD spends in special teams, the more those few players are on the ice and the third and fourth chill on the bench. In cliché speak, it kills the flow of the game. The Bulldog defense and goaltending have continued to be bright spots for the team, but this weekend they are in a hostile arena against a high scoring attack. Aaron Crandall will be the center of attention. Crandall and the rest of the defense corps will have to take this opportunity to put it all together for 60 minutes of solid play to win. Flying Freshmen. The good and the bad. The freshmen are on a tear scoring an average of 3.20 points per game. The down side is finding the rest of the scoring to win games, or to pick up the team when the froshes hit a slump. We stand by our belief that successful teams have balanced scoring across classes. Picks by @afiskness. The Bulldogs are beginning to find some consistency. The defense and penalty kill looks strong, but unfortunately the power play has only seen marginal increases and the Bulldogs continue to take way to many penalties. If the Bulldogs can find some discipline and stay out of the box, I would expect to see the scoring increase. UMD @ UMTC: The first matchup of these teams as non-conference foes. I don't think there will be any change in the rivalry for the players and should be two good games. The Gophers are the #1 team, but I think the Bulldogs will get a split. Denver versus Air Force (home-home series): The Pioneers goaltending looks good this year and even though scoring may not come as easy the Pioneers will get two wins. Western Michigan versus Michigan State (home-home): The Broncos are the better team in this series, but the home game for the Spartans should help them to earn at least a tie. Broncos win and tie. North Dakota @ Boston University: North Dakota is starting slow again this year and trip to Boston against the Terriers could be difficult. But the Terriers just may be the most inconstant team this season in all of college hockey. I will go with a split. Miami @ Nebraska Omaha: The Mavericks are playing pretty good hockey right now making this a tough series for Miami, but I think the Redhawks are a notch above. This looks like a Miami win and tie. Colorado College @ St. Cloud State: The Huskies looks for real and will be competing for the conference title. On the other hand the Tigers look like they are in for a long season. The Huskies sweep. Can UMD Break the Streak of Splits in Grand Forks? UMD owns the last place in their new league mostly because they have only played two conference games. The loss to CC for their only conference win in six games didn’t help either. Getting back into the swing isn’t going to be easy for UMD as they travel to a tough place to win, Grand Forks. The stats show that the Bulldogs should be the better team here, but the cliché of throwing out the records and such definitely applies here. Great to see the #1 ranking for the Bulldog PK. But then seeing the UND PK number tempers the advantage. UMD penalty minutes are on the decline, a positive for a team that has been taking too many penalties for years. Team saves is a solid number for both teams. The question still remains who will play in net this weekend and will it be the same for both nights. Picks by @afiskness. The Bulldogs need to find more scoring which needs to come from the sophomores who are off to a slow start. The defense has been solid all season and I don't know why that would change unless some injuries pop up. I think this currently last place in the NCHC Bulldog team has the makings to contender in the NCHC. Wisconsin @ Miami This should be a good series of Bi6 Ten versus NCHC teams. The Redhawks are the better team in my opinion but they have been inconsistent this season. The Badgers are looking to keep the games low scoring. I think this will be a split. St. Cloud State @ Alabama Huntsville The Huskies will go into the Chargers home rink and skate out with two wins. 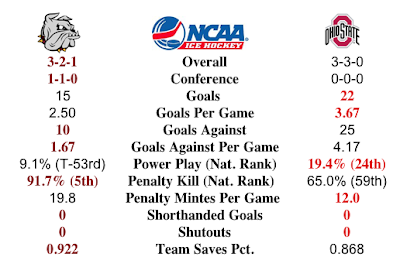 Michigan @ Nebraska Omaha This is another good series Bi6 Ten versus NCHC teams. The Wolverines have looked like a much improved team this year compared to last year. The Mavericks have been very inconsistent so far and now face a tough challenge. This looks like a split, but I think I will go with a win and tie by the Wolverines. 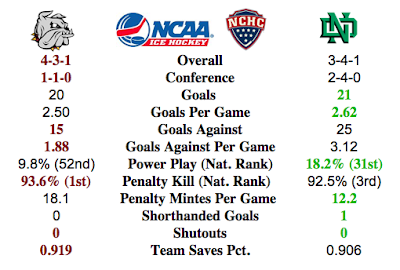 Minnesota Duluth @ North Dakota North Dakota has had some struggles this year and the Bulldogs should be rested after a bye week. This looks like a split. Western Michigan @ Denver The Pioneers have had trouble scoring this year, but their goal tending has been pretty solid. The Broncos have been very inconsistent this year making this a guess as to what team is going to show up. I will go with the Broncos getting a win and a tie. Air Force @ Colorado College This single game on Tuesday puts a good Air Force team against #53 in the RPI, CC Tigers. Are the Tigers really that bad? This game will give us more insight. I say no with a Tigers win. Road splits can be good and this one should probably be categorized as such. But Ohio State is struggling so much with defense this season should have been a feast for the Bulldog offense. What is becoming more apparent is UMD can be their worst enemy this season. Freshman scoring. Four of the top six point scorers are freshmen with the top two being Alex Iafallo and Kyle Osterberg with six and five points respectively. As a side note, those two top scorers have no penalty minutes. Winning faceoffs. Without puck control winning games will be difficult. Over the Ohio State weekend UMD won only 53 faceoffs out of 163. 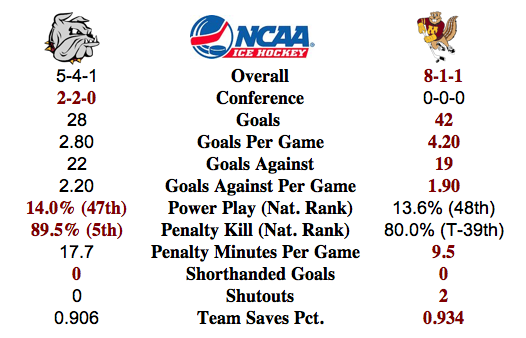 That is just shy of one third of the time UMD has to battle for puck possession off the draw. not what was expected thus far. Both players have identical 1goal, 2 assists, 3 points. After the sophomore slump Herbert endured last season, hopes are we are not going down the same road. UMD is off this weekend before embarking on a trip west on Highway 2 to Grand Forks to take on North Dakota November 15-16.